Originally, I had wanted to come up with a list of the top-five touristy and non-touristy things to do in Buenos Aires and then I realized that: a) that would be a little righteous as everyone´s experience is going to, and should, be different, b) unless you move here indefinitely or are born here, you are going to be a tourist, and c) it´s o.k. to be a tourist. After 6 months, I am no porteña. Still Canadian, thus a tourist. However, I understand the frustration that some may have when trying to take a picture of some beautiful architecture and the photo is ruined by a sea of sun-hats and people you don´t know. So, at the end of this amazing trip, I decided to share some spots around Buenos Aires that are worth experiencing. Obviously there are always going to be tourists but, perhaps, those kind of tourists that are doing exactly what you plan to be doing: getting to know this amazing city. 1) Spending the summer Argentina has its perks for those from the Northern Hemisphere, as it is hot, hot, hot. However, most of the porteños flee the city for their summer houses on sandy beaches, which makes for a very different vibe. Although the city is massive and it cannot be fully depleted of its population, foreigners fill the main squares and pack the cafés. If you want an authentic, dirty, grimy, metropolitan vibe, I recommend seeing Buenos Aires in the Fall. The daytime temperatures stay in the 70´s while nights offer a cooler break. The leaves start changing, everyone starts wearing black (which is awesome), and the fall flowers start to bloom. It is absolutely beautiful. In Congreso, on the corner of Montevideo and Gral. Juan Domingo Peron, there is a restaurant on the southwest corner (whose name evades me at the time of writing). There, you can get down on some delicious chivito set against colorful banners of fútbol teams and pictures of famous Latin American actors. Super-vibin’. 3) Instead of arranging to see a ¨Tango Show,¨ where they charge you astronomical fees, get down to the Plaza Dorrego in San Telmo for its Sunday night milonga that goes from 8 p.m. – 12 a.m. I´m sure the dancers wouldn´t mind a few pesos for a tip, but it beats any overpriced sit-down show. What´s even better is that you can watch locals (or join) tango the rest of the night away. 4) Head to the famous Abasto shopping-mall and be entranced by amazing architecture and hundreds of shops. It has a theatre, an entire level dedicated to watching your kids while you shop, cafes, clothes, a Kosher McDonald’s, etc.. . Then head out and peruse the streets of the Almagro neighborhood. 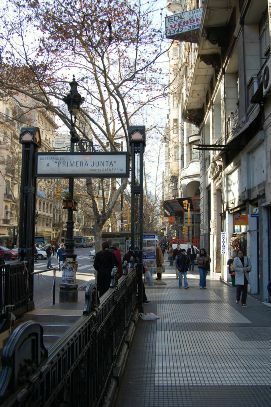 Head East on Corrientes or Lavalle towards the Once neighborhood to find wicked deals on fabric, knick-knacks, containers, leather jackets, books, tiaras for your 15th-birthday, boas, that extra suitcase you will need to put all those souvenirs in, etc. . . All for half the price of the typical, touristy shopping districts like Florida. 5) Head to La Bomba at the Konex on a Monday night for a percussion performance that will blow you away. While there, you have the chance to sip, or guzzle, from the plastic cups that hold a litre of beer for $20AR (around $6US). Then, upon leaving, make sure you don’t just jump into a cab. Buy a burrito de carne from the street vendor, find a Kiosco that sells liter bottles of Quilmes, sit in someone’s doorway and consume both products. Take the bus (the colectivo) back to where you came from (or to a place with more beer).